We’ve been testing two new services, Fonpods and Podlinez, that allow users to listen to podcasts directly from any telephone. Unlike existing service VoiceIndigo, which requires users to listen to podcasts on a cell phone through downloaded software, both of these services require nothing more than the ability to call a telephone number and listen. Podlinez is a dead simple service that launched a few days ago. Go to the site and search for a podcast. If it’s already there, you can look up a dedicated phone number for that podcast. If the podcast is not included, anyone can add it and a dedicated phone line is associated with the podcast. To listen to the most recent episode of TalkCrunch, for example, just dial +1 (831) 480-3920 and listen. I assume the company will add advertising to the site and to recordings at some point to generate revenue. Fonpods, which is currently a TechCrunch sponsor, launched at DEMO in September 2006. It is similar to Podlinez, but has a single phone number for accessing all podcasts, +1 (712) 432-3030. Users can call that phone number (no registration required) and listen to pre-selected content in a number of categories. Registered users can also subscribe to podcasts and access that specific content if they call in from a phone that they’ve registered with the service. 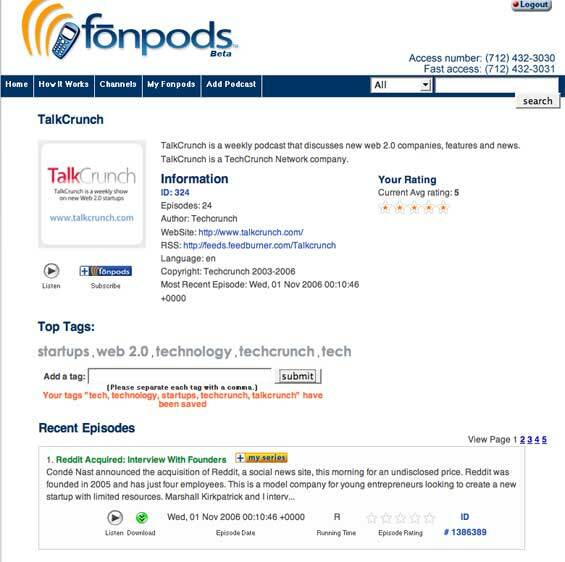 Fonpods also has detailed information about each podcast (TalkCrunch information page is here, for example). These podcasts can be added to a user listening list with a single click. Even though Podlinez and Fonpods are similar services, they are both useful for different things. Podlinez, with it’s dedicated phone number for each podcast, is a good way to “subscribe” to a single podcast and listen whenever new episodes are released. It requires no registration and has zero setup time. Just call the number and listen. Fonpods requires registration and basic setup to subscribe to favorite podcasts, but is a good solution for people who listen to a wide variety of podcasts and want access from a phone.